Note: In the video, the Present Desktop preview displays what you would see if you are using multiple monitors. If you use a single monitor, you will not see this preview. Important: When sharing your desktop, everyone in the Skype meeting can see your programs, files, and notifications. If you have confidential information or files that you don’t want people to see, close them—or use Present Programs instead. At the bottom of the conversation window, click the Present (monitor) button. To share one or more programs or files, click Present Programs, and then select the specific program or file. To share control of your desktop or program with the participants, click the Give Control button in the small toolbar at the top. Learn more in the Give Control section below. Click the pin to hide the toolbar and have more space. To unhide the toolbar, move your mouse to the top of the screen. When the sharing toolbar appears, use any of the controls you need or click the pin again to keep the toolbar visible. Note: While you are presenting, your Skype for Business status changes to Presenting ( ). This means that you won’t receive instant messages or calls. You can change this setting in the Status options window. To have a meeting attendees to share their screen, give them presenter access and they will be able to use the controls. If they don't use Skype for Business, they can still use Skype Meetings App (Skype for Business Web App) to present. After giving control to another participant, you might want to adjust the video size. For information on how to adjust the size of the video presentation, see How to adjust video size on Skype group calls. Click the Stop Sharing button when you are done sharing your screen. If you have more than one monitor, each one will appear on the Share Screen panel. Choose which one you want to share, or choose which one to share. If you use only one monitor, you will not see the Share Screen panel. Also, you cannot a present a program that has user privileges higher than the privileges for Skype for Business, such as the Command Prompt. Program sharing is unavailable if you are conducting your meeting on a remote computer running Windows Vista or an older version of Windows Server 2008. You can present a PowerPoint slide show like a pro when you take advantage of multiple monitors. If you are in a conference room, and you want to display the slide show using a projector or large screen device, then present to the secondary monitor. Your PowerPoint slide show will appear on the big screen for the people in the room and on the presentation stage for the people on Skype for Business. And on your laptop, you'll see the presenter view that shows the current slide, your presenter notes, and a preview of the next slide--visible to only you. 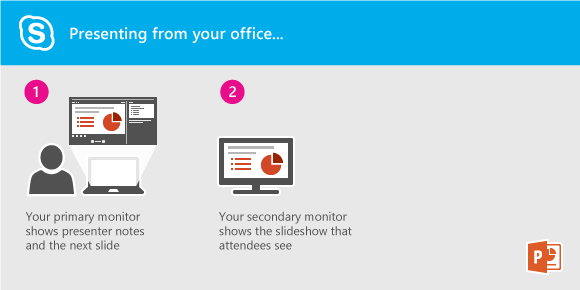 If you are presenting a PowerPoint slide show from your office, and you have multiple monitors, you can present to your secondary monitor and still see your presenter notes view on your primary monitor. 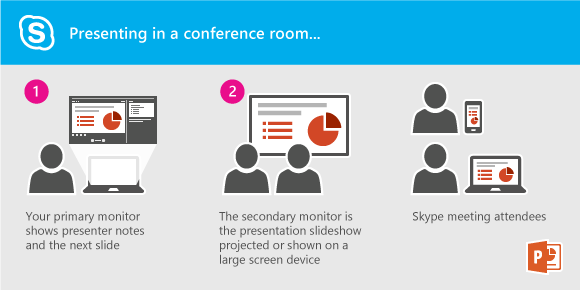 Outside of Skype for Business, open your PowerPoint deck on your primary monitor (or laptop if you are in a conference room). 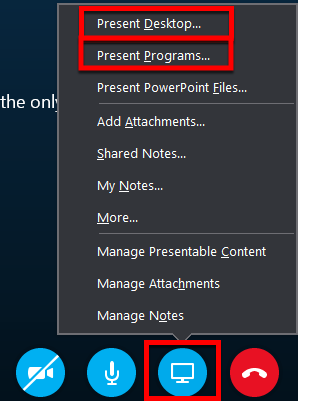 From Skype for Business, click the Present icon, then choose Present Desktop. In the Present Desktop dialog box, click the secondary monitor—or whichever monitor is displaying the attendee view of your PowerPoint deck. On the sharing toolbar, click Give Control. Select the name of the person you want to give control to. Skype for Business sends a notification to that person to let them know you’re sharing control. To take control back, click Give Control again, and then click Take Back Control. Tip: You can allow people to automatically take control of your sharing session at any time, by clicking Give Control Automatically on the sharing toolbar. We recommend you choose this option only in small and casual meetings. To take back automatic permission, click Give Control, and clear the Give Control Automatically check box. Here we provide solutions to various problems you might encounter with screen sharing. Many problems are solved by getting the latest version of Skype for Business. The screen sharing options are disabled — You need to be in a voice or video call to share your screen. If you're not in a call, you won't have the option to share screens. 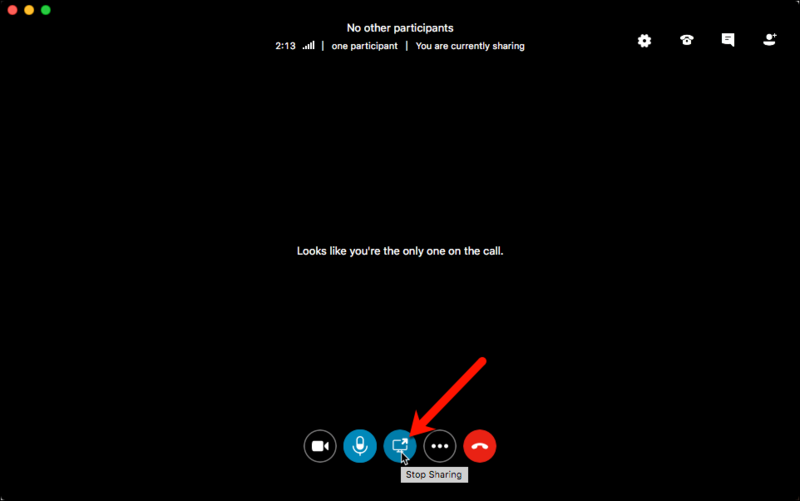 I'm in a call, but I'm unable to share my screen — Ensure that you and the person you are sharing your screen with are using a version of Skype for Business that supports screen sharing. Get the latest version of Skype for Business. I'm in a call, but my screen share (or the screen share of another participant) keeps freezing or going blank — Ensure that you have enough bandwidth to share your screen, and close all applications that may be consuming your bandwidth or decreasing performance—such music streaming applications like Spotify, or iTunes. 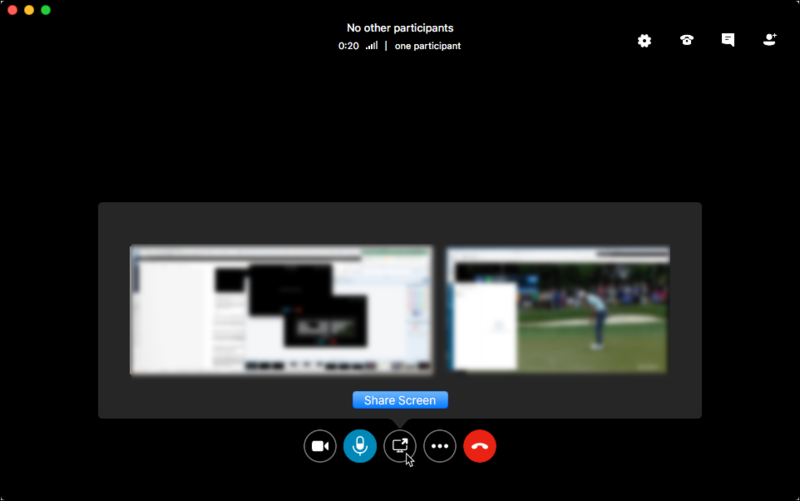 I can share my screen in a call, but another participant cannot share — If the person that you are sharing your screen with is on an older version of Skype for Business, they may still be able to view your screen, but that person won’t be able to share his screen. Recommend that that all participants get the latest version of Skype for Business. The screens I'm sharing look distorted or choppy to the other person — Check to see if the person you are sharing your screen with is using an older version of Skype for Business than you are. Recommend that they get latest version of Skype for Business.